It is now possible to control Agilent's HPLC instruments from the LabSolutions CS analysis data system. 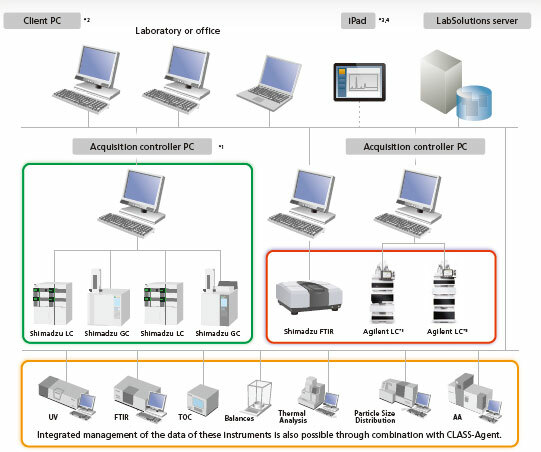 Each of the functions offered by LabSolutions CS, such as integrated database management of analysis data and method information and access to analysis data from each client PC, can be used not only with Shimadzu's HPLC, GC, and FTIR instruments, but also with Agilent's HPLC instruments. LabSolutions CS employs the method editing window and analysis monitoring window of Agilent's OpenLAB. LabSolutions CS offers integrated database management of LC and GC data as well as data from other instruments used in a laboratory, including mass spectrometers, TOC analyzers, and balances, using a server computer database. In addition, allows creation of reports for various types of tests. The acquisition controller PC controls the analytical instruments. Analysis directions and re-analysis of data can be performed using a client PC. It is not necessary to install LabSolutions software on the client PC for terminal service. When using an iPad, the installation of Citrix’s XenApp is required. Agilent's LC instruments can be controlled. Agilent's GC instruments will be supported in the future. By selecting an Agilent instrument from the LabSolutions launcher window, the Agilent HPLC control window can be displayed. The method editing, analysis batch editing, analysis monitoring, and system configuration windows are designed in the same manner as the OpenLAB operation windows. The acquired data is integrally managed in LabSolutions CS, which provides a reliable network environment that complies with various standards through the LabSolutions security policy. LabSolutions CS is compatible with the Agilent HPLC 1100/1200/1260/1290 Series. Note: The above table lists the main compatible models for the 1260 Series and the 1290 Series. For other compatible models, contact your local Shimadzu sales office or distributor.